When Google began adding dates to the snippets in their search results, it became obvious that for some types of searches, fresher dates could help click throughs. But for a lot of results, Google doesn’t show the date, even for content that is clearly dated with a publish date. 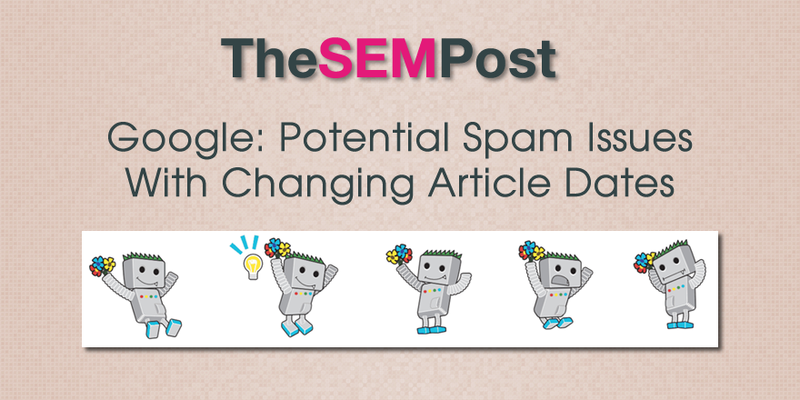 But for evergreen content, some are concerned that even if the content it relevant and completelly up to date that some potential visitors might not click through based on an older date alone. So sometimes publishers will fake the date by continually updated the publish date to show something much more recent to encourage higher click throughs. But are there consequences to doing this? Could it trigger a spam filter for spamming the dates? Could Google remove dates from the site all together, similar to how Google will remove all rich snippets from a site caught spamming rich snippets? I asked this question to Gary Illyes from Google at State of Search this month. From our perspective, from Core Ranking perspective, I’d like to believe that in some way that will hurt you. At least from, let’s say, we will not believe your dates anymore. Imagine if you were a news publisher and suddenly your byline dates would be gone overnight because we believe you were abusing them, you probably don’t want that. So I would advice against that. So while I wouldn’t worry about changing a date a couple of times, a larger scale effort to constantly make dates on articles seem more recent than they really are could potentially cause issues – or at the very least it sounds as though something Google is considering. I then asked from a best practices perspective. Some publishers are including the original publish date, but then adding the additional updated date beneath it, so visitors will be more comfortable knowing that the content has been reviewed and/or updated more recently since the original publication. So would this be the best solution according to Google? I know that especially the news team are working with lots of news publishers, for example the BBC, on trying to figure out how to put content online that is better for the users, and BBC has these very interesting live coverage pages and basically they just time stamp every single addition to the page – that works too. Obviously for some types of content, dates aren’t as important as others. For example, you might look more carefully at dates for an article on latest camping gear, but less closely for any kind of date on an article about tips on staying warm while camping. But content published on the BBC, dates would be much more critical.